As I was typing this entry date, it just occurred to me --- it's Friday the 13th --- not the most auspicious start date for a project! Ah, well, I don't believe in superstitions, so no matter. . . This summer, I got kind of a late start on the project, I know. One reason was that I wasn't quite sure of what kind of an instrument I wanted to do this summer. But I've come to a decision: it will be a (somewhat) traditional classical guitar. The "somewhat" is the bolt-on neck I plan to use, instead of the traditional Spanish heel. I used that method on my "Weird Classical" guitar (way back in 1998! ), and it worked well for me, so I'll be using it again. I'm quite comfortable with this neck joint, and it will make carving the heel and spraying the finish so much easier, as well. A few months back, I had ordered some beautiful curly redwood from RC Tonewoods --- at the time, I had no idea what I wanted to do with it, but it was just so beautiful, I had to have it! For a while, I considered making a steel string with it, but as I'd just done a steel string last summer, I felt like doing something different. So, a classical it would be!!! I spent yesterday figuring out how I wanted this classical to look, and last night I went online and ordered materials. I had already gotten some really nice East Indian rosewood for the back and sides, also from RC Tonewoods (what I especially like about ordering from them is that you see exactly, on-screen, the wood set you're going to get --- no surprises!). I also had purchased some lovely bloodwood bindings, which I thought would look nice with the redwood and the rosewood. I ordered most of my other materials from Luthiers Mercantile and some from Stewart-Macdonald. I'm still waiting on the classical guitar plans I ordered (a Torres plan), so I can't even begin making my mold or my side bending form yet! About the only thing I can do at the moment is to join the top and back. Chances are, I won't be able to finish this guitar before school starts up in late August (the building will be interrupted by a 3-day trip up to Santa Rosa for the Healdsburg Guitar Festival August 17th through the 19th), so this is one project that may extend into the fall. . . . Here is what I've got so far. 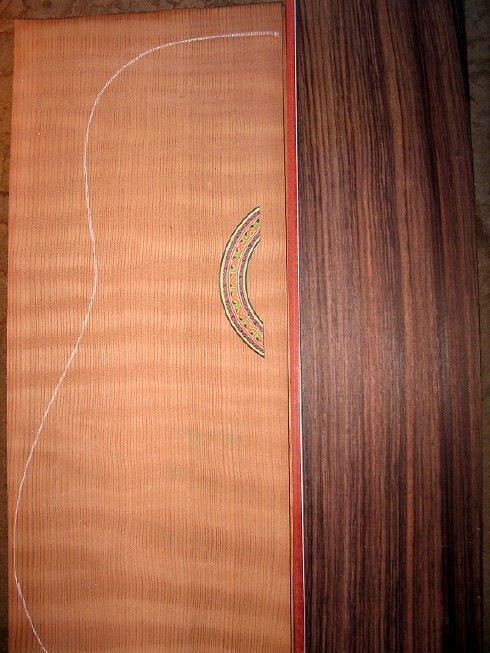 On the left, I have placed the curly redwood top next to the bloodwood binding and East Indian rosewood, so you can see the color combinations. You can see the lovely flame in the redwood, even while dry. It will really look more "shimmery," and the richness of the bloodwood and rosewood will really come out, once the finish is applied. I'm thinking this will be one pretty guitar!